Masataka Taketsuru (1894-1979) was born in the coastal town of Takehara (now Takehara City) about 60km from Hiroshima City. The Taketsuru family owned a "sake"(Japanese brew made from fermented rice) brewery that goes back to 1733. In 1918, Masataka Taketsuru embarked alone on a long voyage to Scotland, where he studied diligently and trained at Glasgow University as a chemist. In this distant land the secrets of whisky-making would be imparted to this young Japanese man, and here he would meet the woman he would marry. He decided to dedicate his life to whisky, chemist and apprenticed at distilleries, learning first-hand from craftsmen and receiving training as a blender, Masataka would later become known as a master blender. 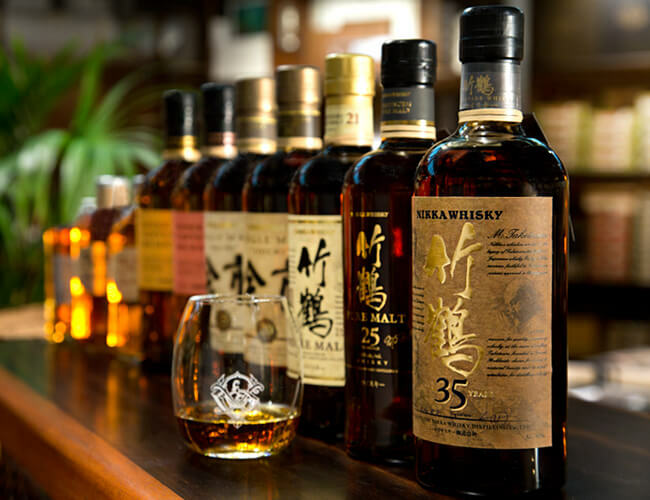 Thus in 1934 Masataka established Nikka Whisky, and built its first distillery in Yoichi, Hokkaido, he had always considered to be the ideal site in Japan for whisky-making, similar in many ways to the Scottish town where he had studied. As his company developed and the enjoyment of whisky became a fixture in Japan, he remained relentlessly passionate about quality, never did he allow it to be sacrificed in favour of efficiency.